The TDP team are at Woolwich this week, on a site with a wide range of interesting features. 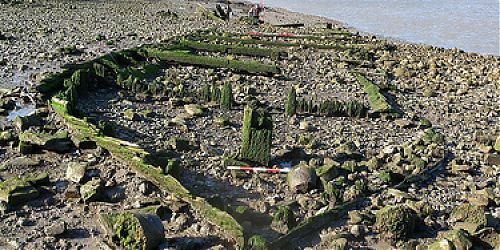 Particularly notable are the substantial remains of at least four wooden barges, hulked on the foreshore and largely covered in silt. Our initial observations suggest that some of this group may be ballast lighters. 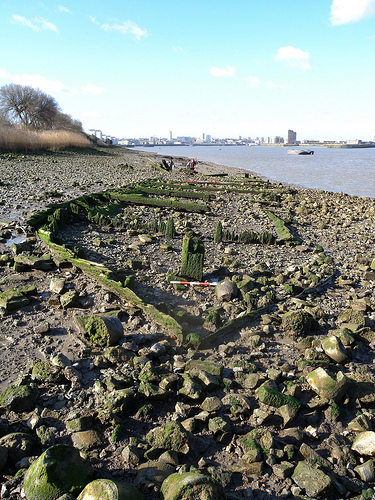 Such vessels were once very common Thames craft, used to transport quantities of gravel dredged from river. This cargo would then be shovelled into the holds of larger vessels, such as the huge fleet of colliers that regularly delivered London’s insatiable demand for coal, and then returned to Newcastle empty. Without the replacement ballast in these vessels, they would be unstable and likely to keel over on a stormy North Sea passage. The humble ballast lighter thus had an important (if unsung) role to play in the working of the 19th-century port of London. Unlike the rather more glamorous Thames Sailing Barges, no examples of wooden ballast lighters survive in working order today, and thus we have a unique opportunity at Woolwich to record them: another “first” for the Thames Discovery Programme. Please keep these images in mind while recording those vessels!